I’ll readily admit that when I first laid eyes on Cat Quest I assumed it would be a derivative RPG lacking in every department. I’ve been burned many times by cute visuals luring me in, only to find that the core game leaves little to hold my attention. I’m astonishingly glad to say that I was wrong. On every level. 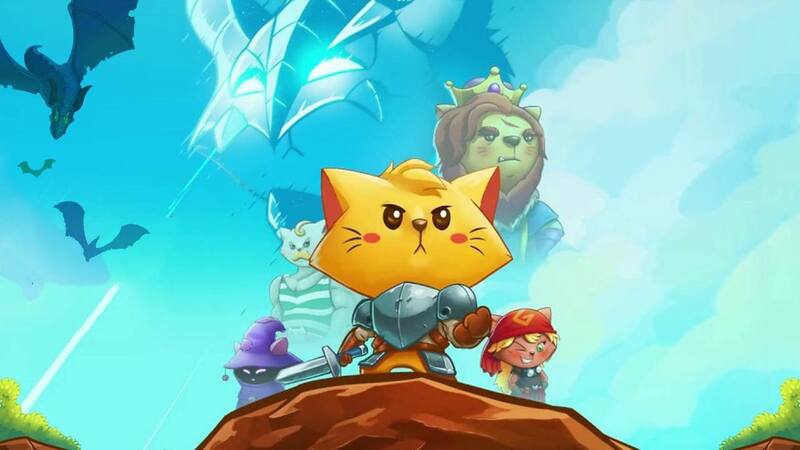 Cat Quest is so much more than cartoon colours and feline puns. Yes, it does look lovely – both docked and handheld, the style bursts from the screen with bold lines and super crisp colour – and yes, there are many cat puns (they never get old). However, beneath those features, is a very charming RPG with surprising depth. It’s pretty much a hack and slash affair, should you choose to stick with a trusty melee weapon, though our whiskered hero is decked out with the ability to cast spells, too. The usual suspects are here; Ice, Fire, Lightning, Healing and each can be mapped to a single button press for quick use. Fighting is simple and is done on the overworld map, as well as in dungeons which have a handy guide to what level you should be before entering. I jumped again into assuming and thought that Cat Quest would only hold me for a few hours of story. I was half right. The story is a little lacking and can be repetitive – there’s only so many fetch quests one can do – but thankfully there are dungeons and bosses that will have you grinding to level 150 so that you stand a chance. So, while the story only plods along, the remainder of the game stays inviting. And there is a lot to do. Most dungeons can be cleared out in a few minutes if you’re over the recommended level. Attempting one too soon will see you flattened within seconds and running off with your tail between your legs. You’ll return though, and very likely with new armour and weapons. There are so many items to collect and combinations to try out which will boost various stats and it’s a small thing to note, but the tiny cat avatar changes appearance with each new equip and really holds a great level of detail. Spells can be upgraded with money looted in caves or from corpses and juggling them to find enemy weaknesses is a joy. Did I mention that as a cat you have to fight an army of dragons controlled by an evil mage? I’m not kidding, it’s a purrfect combination of crazy and fun. It’s pawsome. The cat’s pajamas. It’s refreshing to find a game that doesn’t take itself seriously, but can also deliver interesting takes on tried and tested video game tropes that stay entertaining.